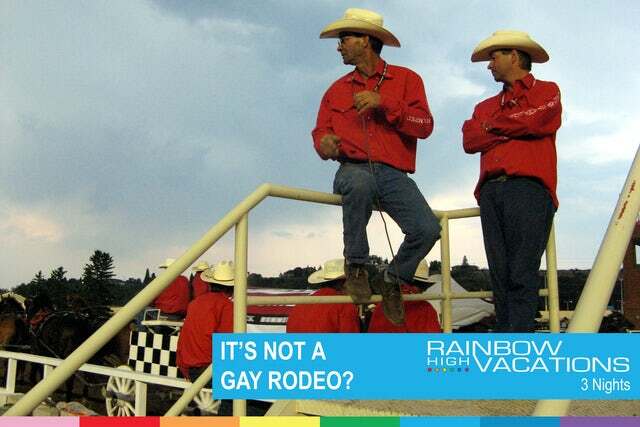 If you’re visiting Toronto for WorldPride 2014 it make sense to stick around, head out West and take in the world famous Calgary Stampede! From the moment you arrive at your gay-friendly Calgary hotel accommodation you’ll feel part of the action. Calgary is an active modern city of more than a million residents, embodying hospitality, community, and entrepreneurial spirit. Its rich western heritage, cultural vibrancy and urban energy make it a unique destination. During the Calgary Stampede the city kicks into another gear, welcoming visitors to one of the world’s great celebrations. It was here that Ang Lee filmed Brokeback Mountain! So, while you are here, you might want to visit some of the locations where they shot. While in Calgary check out The Twisted Element Nightclub to see some go-go boys or drag shows! The Calgary Stampede is made up of sights, sounds, tastes and feelings that create a lifetime of memories. A century of tradition is distilled into 10 days of music, food, excitement, education, friendship, and community. Whether you’ve walked across the street or flown around the world, you’ll enjoy an eventful and unique experience. Don’t miss the Greatest Outdoor Show on Earth in Calgary! YEE HAW!